How Can We Calculate the Response to Selection? Now that you’ve seen and learnt about the different aspects of the formula to predict response to selection or genetic gain, let’s take an example and do the calculation together. Try to really understand and repeat what dr. Mario Calus does, so that you are able to do the calculations by yourself in the exercises that will follow after this video! Maximizing genetic gain is one of the focal points of a breeding program. But how is genetic gain calculated? Today we will demonstrate this by means of an example. which is often also referred to as the response to selection per year. the accuracy of selection r<sub>IH</sub>, and the genetic standard deviation (sigma A). Finally, the genetic gain per year is obtained by dividing the response to selection by the generation interval L in years. Let us consider the following example about running speed in horses, on a 2,000 metre long track. In this case, the breeding goal is the racing time across 2,000 metres. the genetic standard deviation is 3 seconds, the accuracy of selection is 0.24, and the generation interval is 10 years. Now, the question is: what is the value of ∆G? As a first step, we compute the response per generation, assuming that the accuracy is 1. Now we need the value of the selection intensity, given that the proportion of selected animals is 10%. we can find that this is 1.76. Considering the value of the genetic standard deviation of 3 seconds, we can compute that the response per generation is 5.28 seconds. As a second step, we replace the accuracy of 1 by its actual value of 0.24. Keeping the other input parameters as before, we now get a value of 1.27 seconds per generation. compared to the maximum possible response with an accuracy of 1. As a third and final step, we want to compute the genetic gain per year. This involves dividing the response by the generation interval. In this case, this is 10 years. So, finally, we obtain that the genetic gain is 0.127 seconds per year. the assumed selection approach is expected to decrease the racing time in 2,000 metre races by 0.127 seconds per year. Now that you are able to perform calculations with the formula to predict genetic gain, let’s take it one step further and dive into the elements of the formula and their relationships. The formula is of course used to predict genetic gain in a given situation, but can also be used to optimise genetic gain by varying the different elements of the formula. However, the different elements of the formula are not independent of each other. In the following clip, dr. Mario Calus will tell you more about this. The success of a breeding program is largely determined by the genetic gain per year, denoted by ∆G. In previous clips, different components involved in ∆G and its computation have been discussed. The challenge is that several trade-offs exist between the elements of ∆G. and on how to balance them to optimize genetic gain per year. Let’s start with a brief recollection of the formula for ∆G. Three of its components, indicated here in blue, are under the breeders’ control. These are the selection intensity i, the accuracy rIH, and the generation interval L.
The fourth component, the genetic standard deviation, is assumed to have a fixed value. Optimizing ∆G is a matter of balancing the selection intensity, the accuracy, and the generation interval. Now we will show an example of a trade-off between the accuracy and the selection intensity. with a heritability of 30% and a generation interval of 2 years. The breeding program aims to select 10 animals. Measuring this carcass trait for an animal, requires that the animal is slaughtered. But of course, we don’t want to slaughter selection candidates. Therefore, the trait is measured on a number of half-sibs. based on the heritability and the number of half-sibs tested. The formula as shown here, was previously mentioned in module 5.
and the accuracy, which plateaus towards a value of one half. which has a maximum capacity of 5000 individuals. multiplied by the number of half-sibs tested per candidate, should not exceed 5000.
and the number of half-sibs tested per candidate. or we can test 100 half-sibs of 50 candidates. So, the question is: which numbers will give us the highest genetic gain? making use of all the other parameters that we know. 50, 100, 200, or 500. We can compute and plot the genetic gain for every possible number of selection candidates. From this plot, we can see that the highest genetic gain is achieved when testing 21 half-sibs for each of a total of 236 selection candidates. trade-offs can also exist between the accuracy and the generation interval. where a breeding value of a female sheep for a carcass trait may depend on measurements in its progeny. with every new litter reaching the age of slaughter. At the same time, however, the generation interval will increase as well, which reduces the genetic gain per year. Let’s briefly summarize the main messages of this lecture. the selection intensity, the accuracy of selection and the generation interval. Several trade-offs may appear between these parameters. therefore requires careful balancing of these parameters. In the previous sections, you learnt how to predict the response to selection. By performing selection, we determine which animals will become parents of the next generation, and which animals will not reproduce at all. However, until now we have not looked into the combinations of parents. This is what we call mating. The central question here is: Which male fits best to a certain selected female animal? Which criteria do we use? Watch the clip by dr. Piter Bijma to learn more about the process of mating. I guess everyone has some idea of the meaning of “mating”. But what precisely does “mating” mean in animal breeding? That is what I will explain in this clip. Mating refers to the pairing of the selected sires and dams. So mating occurs after selection. With selection, we decide which individuals become parents of the next generations. With mating, in contrast, we decide how the individuals that have already been selected as parents are combined to produce offspring. Here you see four dogs, two males and two females. and now we want to mate them. We could, for example, mate Jim with Jill, and Boris with Casey. Alternatively, we could mate Jim with Casey and Boris with Jill. Now what would be a good strategy to mate the selected parents? where sires and dams are just combined at random. Random mating is used a lot, and is often a good choice. However, we can do a bit better. which would result in highly inbred offspring. It is better to avoid such matings. If Jim and Jill descend from the same father, for example, it is better not to mate them. In this way we can avoid highly inbred offspring. We can go a bit further and use mating to minimize the inbreeding of the offspring. This is called minimum-coancestry mating. With minimum-coancestry mating, the least related sires and dams are mated. In this table you see the relationships between the sires and dams from the dog example. The relationship is lowest between Jim and Casey, and between Boris and Jill. Therefore, to minimize inbreeding in the offspring, we should mate Jim with Casey and Boris with Jill. So far, we have only considered inbreeding. However, sometimes we want to choose matings based on traits. This is the case for so-called optimum traits, where intermediate values are preferred. For such traits we can use compensatory mating. Here you see teat length in dairy cattle as an example. whereas cows with very long teats have higher chance of mastitis. So farmers prefer teats of intermediate length. In this table, you see compensatory mating for teat length. Cows with very short teats are mated to bulls that give daughters with very long teats, and vice versa. In other words, we choose a bull that compensates the trait of the cow. In this way, we can reduce the chance of getting offspring with extreme teat length. that have been selected as parents for the next generation. While random mating is common, mating can be used to avoid high inbreeding or to compensate for weaknesses of the parents. Module 6: Response to Selection > 6.1 Introduction > Welcome to Response to Selection! Welcome to Module 6 on Response to Selection! Now that you have learnt how you can rank the animals in your population, to decide which ones to choose to produce the next generation, it is time to proceed to the next step in the breeding program. Imagine a horse owner wants to breed faster racing horses, or a dog breeder wants to reduce inbreeding in the dog population, or maybe there is a chicken farmer who formulates a breeding goal to increasing the amount of eggs in laying hens. Imagine that they have just finished ranking their animals based on the estimated breeding values and are about to start producing the next generation. Of course, they are curious what they can expect in the next generation. How much faster than their parents will the new generation of racing horses be? How much can inbreeding be reduced in one generation? How many more eggs will the new generation of chickens be able to produce? Or, in other words, how can we predict the genetic gain that can be achieved? What will the selection response be? In this Module 6 you will learn how to answer these questions! Which information do you need to be able to predict genetic gain and why? Here, you will be introduced to the formula to calculate response to selection or genetic gain yourself! Which choices influence the amount of genetic gain? How do they interact? Genetic gain is influenced not only by the selection of a ‘pool’ of parents, but also by the combinations of parents that are made. You will learn more about this in the section on mating. Is it wise to use the very best bull to mate with all cows of one generation? Why or why not? Apply what you learnt in this module to your own breeding program with your animal species of choice! Test your knowledge on module 6! Image: Breeding program. The red circle shows the step on “Predicting selection response” that module 6 is about. 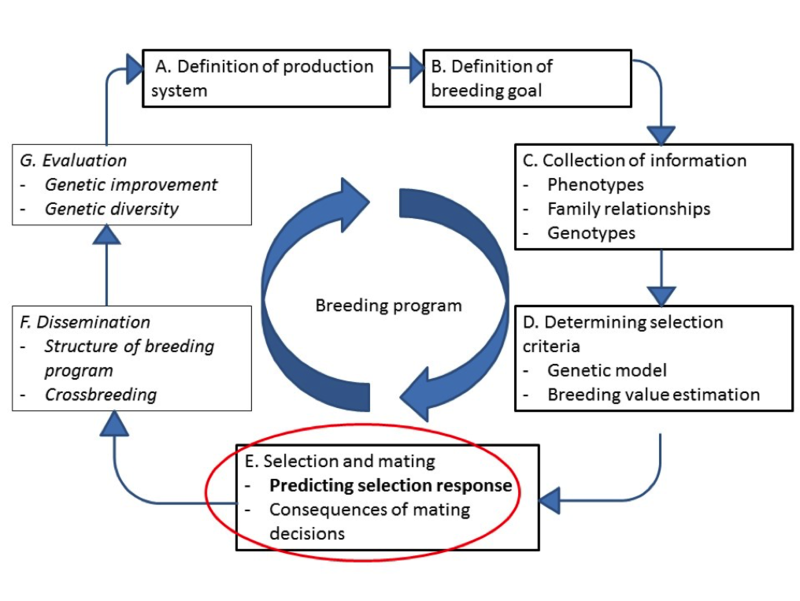 The structure of breeding programs differs substantially between animal species. An important reason is the differences that exist in reproductive rate. Sows and hens can produce many more offspring than cows and mares, and some fish species can produce even more. Another important reason is the ownership of the animals which may even be different for the males and females of certain species. Reproductive rates range from one offspring every few years to many thousands of offspring per year or even per month. In addition, the rate often differs between males and females. Males often have higher reproductive rates than females. This leads some programs to focus more on selection in males. The number of males needed is smaller which leads to higher selection intensities. An added advantage is that with fewer animals, the cost of keeping the breeding stock becomes smaller. Sometimes the biological reproduction rates can be enhanced by technological interventions. In dairy cattle breeding, artificial reproduction techniques such as artificial insemination (AI) and in vitro fertilization, in combination with embryo implantation, are well-developed and widely used in the breeding population. This provides the opportunity to produce large numbers of offspring from superior sires and dams, and disseminate the genes of these superior animals widely in the production population. In animal species that are kept for companionship or leisure purposes, control over the breeding program by the breed associations is very loose because the animals are owned by private owners. These private owners each decide individually on the breeding of their animals. In some species, like the major dairy cattle breeds, the males are owned by a breeding company or a group of breeders, and the females are privately owned. In both cases the breeding company or association depends on the breeding decisions of the private owners. Breeders can only completely control the breeding decisions when they own both the males and females in the breeding program. The difference in reproductive rate and in ownership of animals leads to different structures of breeding programs. Here we present 3 different structures that are often found in animal breeding. In breeding programs with a flat structure, nearly all animals can potentially participate in breeding. In most cases, the breed association only has a strong vote in the selection of the males for breeding. Results of shows where animals are judged largely determine which males are used. This often results in a few “champion” males that are very widely used as sires in the whole population. This type of selection takes place in most breeds of dogs, sheep, and horses. All of these species tend to only perform directional selection in the males, where in some breeds the males are selected using more information than in others. When the breeder owns both the males and at least a limited number of females, the structure becomes a nucleus. Selection among the females, and the males, is under the control of the breeder. Privately owned animals (usually females) can be invited to become part of the nucleus, which is why it is called an open nucleus. The best examples of open nucleus structures are the breeding programs for dairy cattle. In the main breeding programs for pig and poultry production (pork, eggs and broiler meat), the commercial breeding companies have full control over all breeding activities. They own a limited number of breeding animals (i.e. their selection lines). In these lines, the companies determine the breeding goal, organize the data collection and the breeding value estimation, and decide which animals are selected and mated to produce a new generation. These pure line animals are not the ones that produce the final product: animals producing the meat or eggs for the market. The final product often consists of a cross between three or four different lines. After the breeding program is established, no new animals are introduced in the program. The mostly globally-operating breeding companies have different selection lines. These selection lines are separate breeding populations. To produce animals to lay eggs or to grow meat, contracted farmers multiply and cross the selection lines in a pyramidal structure. 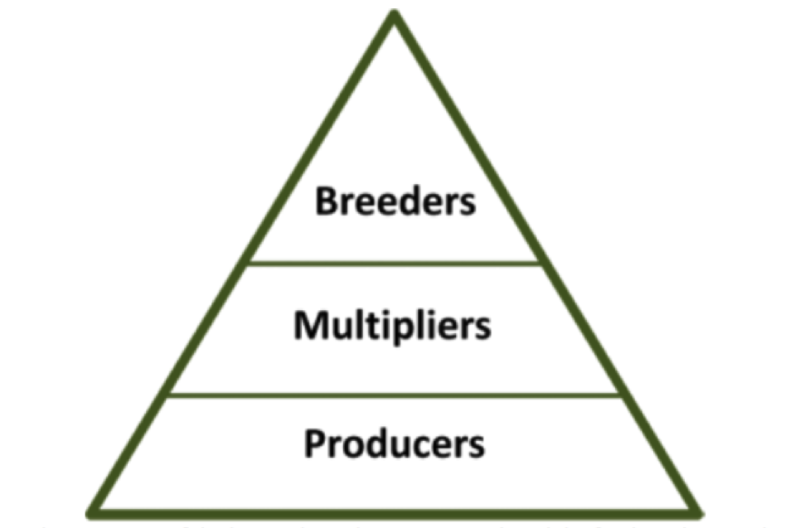 Image: Pyramidal structure of a breeding program where selective breeding occurs in the top and farmers are supplied animals via multiplication steps in the middle of the pyramid. In commercial pigs, poultry, and fish programs, selection takes place in the top of the breeding program. Especially in pigs and chicken, and sometimes in fish, a few “multiplying generations” are needed to disseminate the selection response obtained in the top of the structure to the production animals. The (small) breeding population in the nucleus, the generations needed to increase the number of animals with improved genetic values, and the (large) production population is often depicted in the form of a pyramid. The figure below shows the structure of a poultry (broiler) breeding program. This pyramid has some more detail than the one in the previous section, but the general idea is the same. Within the commercial breeding scheme for broilers the selection response is realized in specialized lines. Usually a four-way cross is applied to produce the final broilers that are grown for their meat. Two lines are selected for fertility and egg quality (the “female” lines) and two lines for growth traits (the “male” lines). In the broiler structure the selection takes place at the top of the pyramid in the pure lines, resulting in a limited number of genetically superior animals. These superior animals are used in the pyramid as Great Grandparents. When the selected Great Grandparents are multiplied in sufficient numbers, they produce Grand-parents (see table 2). These Grand-parents are then crossed with grandparents from another line. The Grand-parent crosses result in F1 animals that are called Parents. These Parents are then mated to a F1 parent from cross between two other lines to produce the broilers. The pure line and the F1 animals (Parents) are often owned by the breeding company to protect the characteristics of their lines and the realized genetic improvement in these lines. In table 1, an example is given of the number of broilers that can be produced from 1 single hen in the nucleus. This pyramid involves 5 tiers. Taking all tiers together, one hen in the nucleus can have 2,880,000 descendants as broilers in the commercial tier. Parents in each tier are used for one year. This means that the genetic merit of the nucleus animals is expressed in the great grand-parent stock after one year, in the grand parent stock after two years and reaches 2,880,000 broilers after 5 years. Table 1: Example of pyramidal structure for the dam lines of broilers involving 5 tiers and the number of offspring in each tier that descend from one hen in the nucleus. What is a Breeding Value? A breeding value is nothing more than a value that you give to a particular animal to indicate its value for breeding in a certain breeding program. This means that the breeding value depends on the traits you are looking at, which subsequently depends on the traits that you have defined as important for your breeding program. A breeding value is defined as a deviation from the population mean, meaning that animals with a positive breeding value have genetic potential that is better than the population average, and animals with a negative breeding value are less valuable than the population average. When you have determined the breeding values for a certain group of animals for a certain (combination of) trait(s), you will be able to rank the animals according to these breeding values. For example, if you want to have larger animals, you can rank the animals based on their breeding value for the trait “body size” and you can select the ones with the highest breeding value as parents for the next generation of animals. This enables you to select the best animals, those that you want to breed with in order to have an improved next generation! Now you will get more explanation on the concept of breeding values and we will challenge you to estimate breeding values yourself. 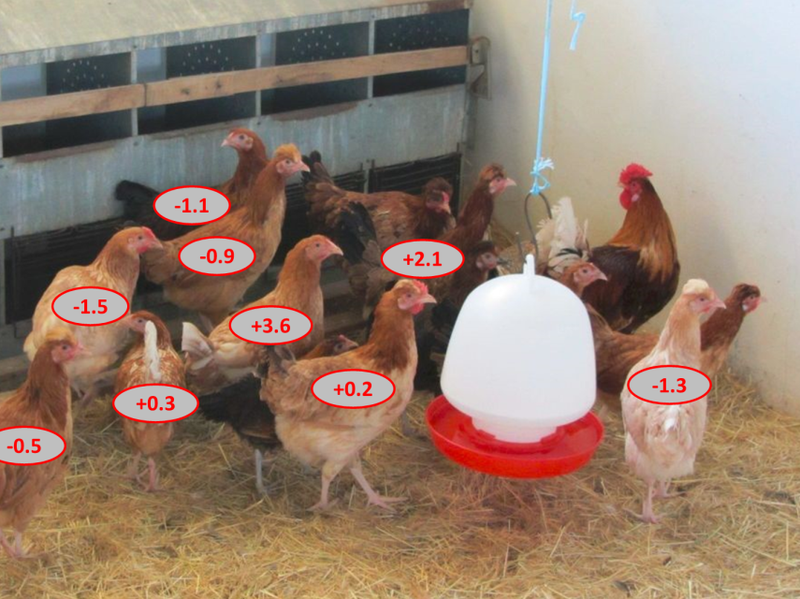 This image shows Horro chickens at the Debrezeit research station in Ethiopia, with their estimated breeding values.